My cousin Jim passed away in September 2009. He was in his mid-sixties at the time and I thought that he was entirely too young to have left us. Though I still think that, I know this also has to do with the boyish face that he had maintained throughout his lifetime. And to bring a very quick smile to it, all one needed to say was Villanova. 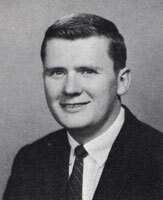 Jim attended the University both as an undergraduate and graduate student in the 1960s. He studied what would remain the two constants in his life: literature and theatre. My own first exposure to theatre at Villanova and at any forum, in fact, I owe to Jim. His mom, my Aunt Catherine, had taken me to see him dramatize a series of character sketches from Shakespeare in the old black-box theatre that sat in the vicinity of Dougherty Hall and what is now the Connelly Center. He proudly became that day My Cousin the Actor, even boasting the same name of a then well known film star. His love of literature and theatre began before the fine-tuning he gave it at Villanova, however. Going to my grandparents’ home, where he lived with his mother and our aunts, always seemed like a field trip to me because I could raid his room stuffed with records, magazines and books. Most prominent was the collection of annuals devoted to the “best” in film and the “best” in theatre that he had begun to amass as a young teenager. He never minded when I, six years younger than he, pulled them out of his bookcase or pestered him to read passages I couldn’t understand. Remembering those books and Jim’s tutoring us in the ways of reading or diagramming sentences, my cousin Bob and I would always say—and still do—that Jim was our first inspiration, as we both went on to do what he eventually did: teach English. 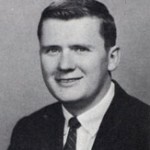 Jim began that career with a one-year stint at a state college, but he spent nearly all of his career at Upper Merion High School. He loved teaching and loved coaxing his students to love what he loved, namely, reading. When he retired several years ago, he said it gave him more time to read and to return more prominently to one of those first avocations, acting. He performed at several local theatres in the last years, including Hedgerow and Footlighters in Berwyn, a fitting coda, it would seem, for the man who first found the actor within with lead roles at nearby Monsignor Bonner High School and later at Villanova. When Jim died, my cousin Bob and I went to his home and, at some unspoken but shared moment, we simply stood and looked at the massive bookcases in his living room. Just like his room when we were kids, records and books were strewn all over, but there on so many shelves rested the old theatre and film books we both had treasured when we visited our elder cousin. So it comes as no surprise to me that Jim left a bequest to Villanova and, in particular, to the library. He loved the University and with his passion for reading knew there was no better way to serve it in his passing than to honor the library where he likely spent so much of his time. Dr. Gail Ciociola, assistant professor, teaches American drama and contemporary literature in the English department. Like her cousin Jim, she also holds two master’s degrees from Villanova University. Mr. Mason was my favorite teacher at Upper Merion High School many years ago. I am greatly saddened to hear of his passing. He was an extraordinary teacher and a wonderful mentor.